Hi, foodies.Welcome to AYESHA'S KITCHEN. Quail eggs are very tasty and healthy delicacy which is available all over the world. It is very popular in Kerala (India) as this egg is high in nutritional value when compared to ordinary eggs. 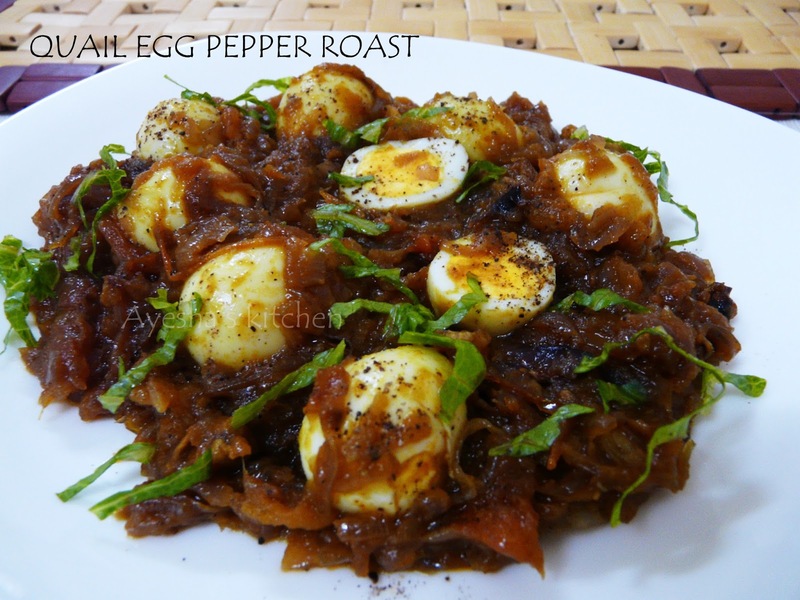 Here am sharing a very tasty egg roast recipe that kids will love to have for their tiffin. So here is the recipe of quail egg in pepper masala roast/egg roast/egg recipes / Kerala style mutta roast / kada mutta roast/pepper egg roast/egg curry for dosa/quail recipes. Enjoy!!! When done, add green chilies along with salt. Again saute for a while and now add tomatoes sliced. Cook till the tomatoes are well done. Now add turmeric powder, ginger garlic paste, chili powder and pepper powder (1 tsp). Mix well and cook well until it becomes a smooth and thick gravy. Then check for salt and when done, add curry leaves and chopped coriander leaves. Finally, add the hard boiled quail eggs and gently mix. Cook for 2 minutes on a low flame. You can also toss the hard boiled eggs for 2 minutes in 1 tsp of oil in a separate pan before mixing it with the masala gravy. But I skipped this step. Finally, add 1 Tsp of pepper powder and mix well. Serve hot with Dosa, Appam, Chappathi etc..